Note that wine delivery is only available to certain states. Sip, Sip, Hooray! It's Rosé time! 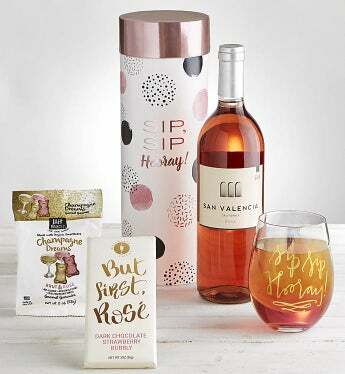 Surprise the Rosé lover in your life with this fun enjoyable gift. Filled with all Rosé theme gummie bears, chocolate, and of course a California Rosé wine. No need to get a glass out of the cabinet for the wine, this classy gift comes with an adorable iridescent stemless wine glass. Perfect for Rosé anytime of day and to make someone's day, to make them say Hooray! This is a brilliant, hot pink California Rosé that draws you in with subdued aromas of raspberry and watermelon rind. It follows through with a sweet and juicy palate, balanced by fresh acidity. WARNING: Drinking wine and other alcoholic beverages may increase cancer risk, and, during pregnancy, can cause birth defects. For more information go to https://www.P65Warnings.ca.gov/alcohol.